A lonely moor stretches out in all directions, barren grass mottled by craggy boulders and moss-covered outcrops, buffeted by ice-cold winds that sweeps down from a distant cluster of hills. The only features of this bleak landscape, appearing only as shadows beneath a damp wall of fog, are occasional lofty stone formations, either human made or natural. It’s impossible to tell. Is this a land long untouched by human presence, or one that resisted human presence, turning them away by its very harshness? Either way, the wind seems to carry the echo of ghostly voices, their cries inchoate, all meaning lost. This is the world that Fog Tropes/Gradual Requiem, originally released in 1984, conjures up in the listener’s mind. 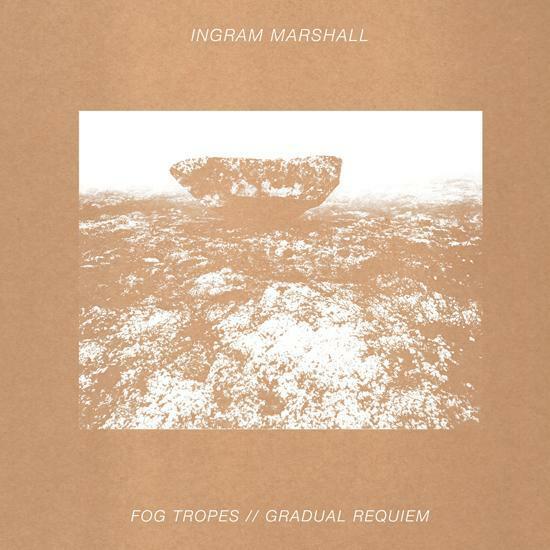 Ingram Marshall distills a form of minimalism that eschews the austere formalism of the genre’s early landmarks (by the likes of LaMonte Young, Tony Conrad and Pauline Oliveros), instead focusing on using the barest of means to conjure music that is deep in atmosphere and emotional potency. ‘Fog Tropes’ is based on samples of fog horns recorded in San Francisco bay, but wrenched from any locational context by the injection of a ghostly voice lamenting sadly behind the distant sounds of intermittent brass interjections, birdsong and wind. In such a melancholic context San Francisco could not feel further away and we are pitched straight off the bat onto that shadowy landscape of barren moorland and fog-wreathed dolmens. The piece gradually unfolds with dramatic timing, the voice multiplied, the brass becoming more and more insistent, laden with dolorous portent. ‘Gradual Requiem’ is divided into five parts and, as its title suggests, there’s a funereal quality at play that means it fits neatly alongside ‘Fog Tropes’. Balinese percussion gongs are gently caressed or tapped, sending rippling tones back and forth whilst a haze of tape manipulations and electronic effects dampen the sense as if heard from under a mortuary shroud. Each part of ‘Gradual Requiem’ is distinct from the others, forming an emotional tapestry that follows the composer’s reactions to his father’s death. ‘Part 2’, for example, features almost ebullient, comforting piano, whilst ‘Part 3’ is dominated by jauntily plucked lute or guitar arpeggios, which slowly recede into a drifting, mournful duet between guitar and piano, somewhere between the sadder sections of Keith Jarret’s Köln Concert and the more wistful works of Sandy Bull. On ‘Part 4’, an echoing chorus of wordless vocalisations intone a melancholic lament, the voices multi-layered into they form a haunted eulogy. Gradual Requiem is an emotionally potent, even harrowing sonic voyage, and one of the most affecting pieces of modern minimalism I’ve ever heard. When so much modern music is described as being “haunting” or “liminal”, it’s easy to become a bit blasé at such terms, but these two compositions resonate with intangible, phantomatic grace and unease, conjuring up emotions and visions that seem to reach beyond time and location into something that swirls beneath the collective consciousness. It will have different meaning for different listeners, but few will come away from Fog Tropes/Gradual Requiem unmoved. This entry was posted in 2014, Music Reviews, The Quietus and tagged drone, experimental, Minimalism, music, music journalism, The Quietus. Bookmark the permalink.